After spending some time with my family, we hitched up the ol' four wheel drive sleigh for our trip to Montana! It's about a 4 hour drive through two mountain passes. The roads were squirrelly & icy, as was our toddler. Liam has recently decided that he doesn't like to nap in the car, so it's 4 long hours of pointing out every horse, cow, & donkey. Every semi truck, pick up truck, tanker truck, snowplow truck, camper, trailer, & RV. And if we are especially lucky perhaps a police car or fire truck. And when even all that becomes boring it's nonstop renditions of Wheels on the Bus & Baby Beluga. It's exhausting. Being confined like that for 4 hours is exhausting. While I had hoped to have plenty of fun in all the fresh snow, mother nature had other ideas. Temperatures were in the negatives or single digits for most of our visit. Brr. And a little more brr. Instead we kept our warm bodies at The Bigfork Inn (the Keenan Family restaurant) for some of the best eats and some pretty great company. 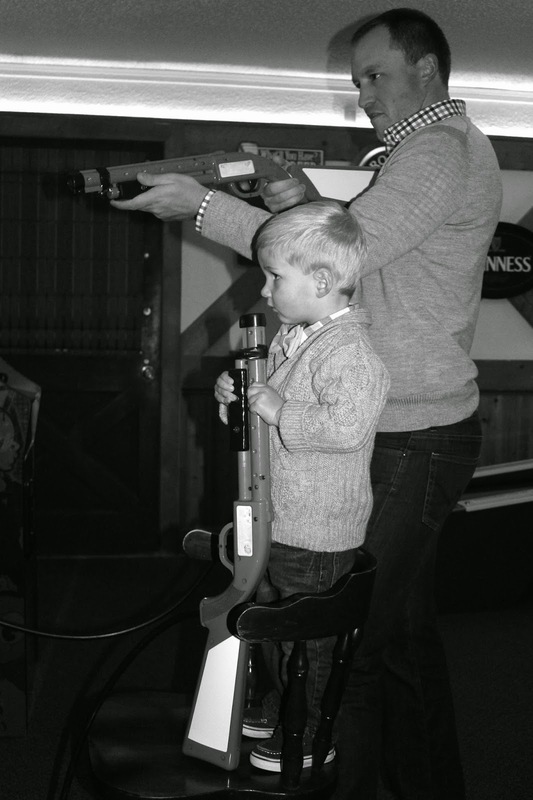 Liam was perfectly content with all the pub games: Big Buck Hunter & Skee-ball being his favorites! Unfortunately I caught the stomach flu that was going around during our stay, so I was absolutely miserable for one day! 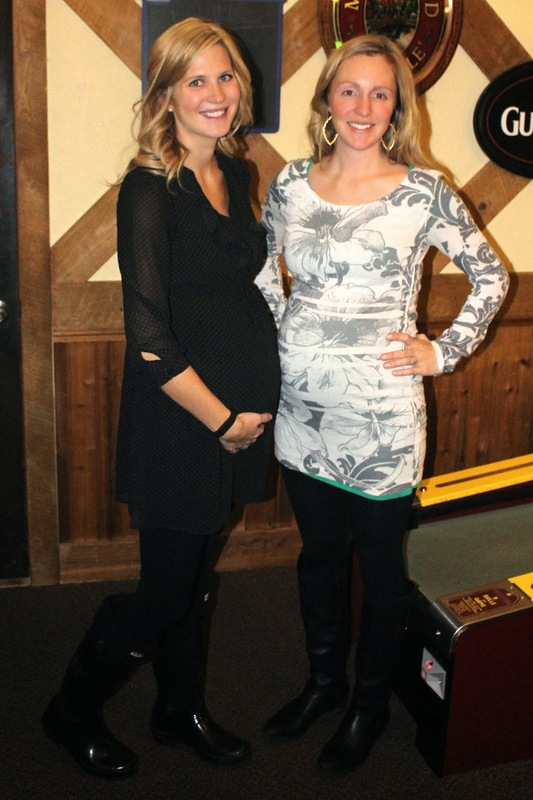 But with so many aunts, uncles, & cousins on hand to help, Liam was the happiest little boy. 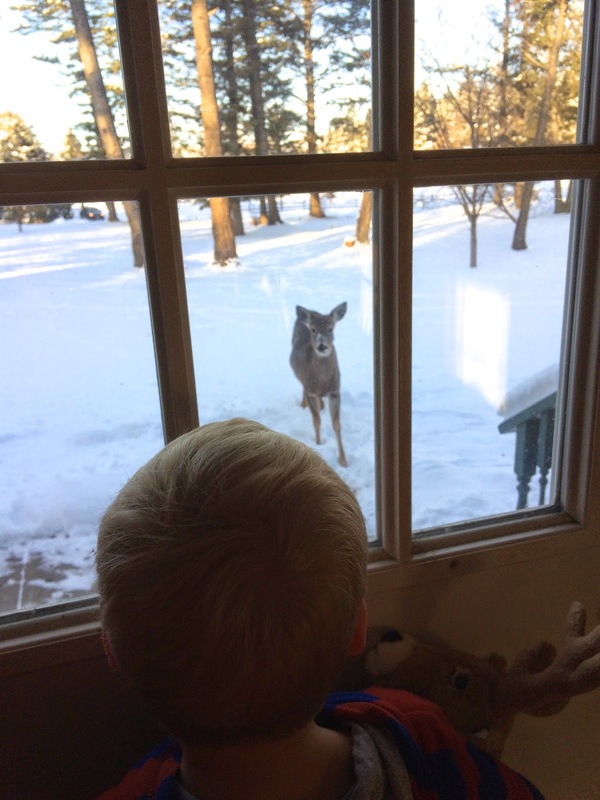 Grandpa put out oats so he could do a little reindeer watching out the window, and his Aunt Sara brought her bunny home from college. I think we need a bunny because that fuzzy little thing had Liam's heart! By NYE I was feeling much better, but still quite lethargic. Conor's sister (who is also pregnant, about 10 weeks ahead of me) and her family joined us for dinner at the family restaurant, and then we were all in bed by 10:30 pm. I know you are all super jealous of that wild night! Perhaps 2015 will bring a tad more excitement, although right now I get pretty excited about sleep! No visit would be complete without a trip to the other family business, Sweet Peaks! The best, most delicious, & delectable icecream shop! Liam hounded his Uncle Sam asking when the shop would be open nonstop! 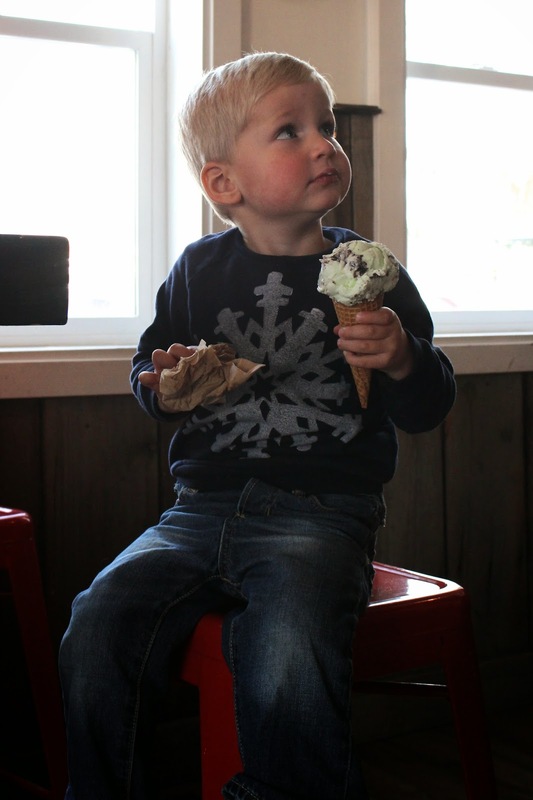 Liam went with the candy cane flavor, but then insisted upon steeling my cone and sampling Conor's as well. The place is seriously toddler heaven. A place where Liam wished he could sample every flavor 'til his belly was full, although I'm not quite sure that he would ever have his fill of icecream. He's a dairy lover that one! Again it was sad to leave. Especially since no one was looking forward to another 4 hour drive. But we'll be back to see part of the family when we fly (thank goodness) to Montana for my best friend's wedding in February. We can never stay away too long! Montana is 100% on my list of states to visit. It sounds so beautiful, albeit cold. I can only imagine how hard a 4 hour drive is with a lil one. I don't like being in the car longer than 2…haha. You looked beautiful on NYE and that ice cream looks delicious! Well now I want some ice cream! :) Sounds like a fun trip despite the stomach flu and chilly conditions! That's so fun that you have a family inn and ice cream shop. 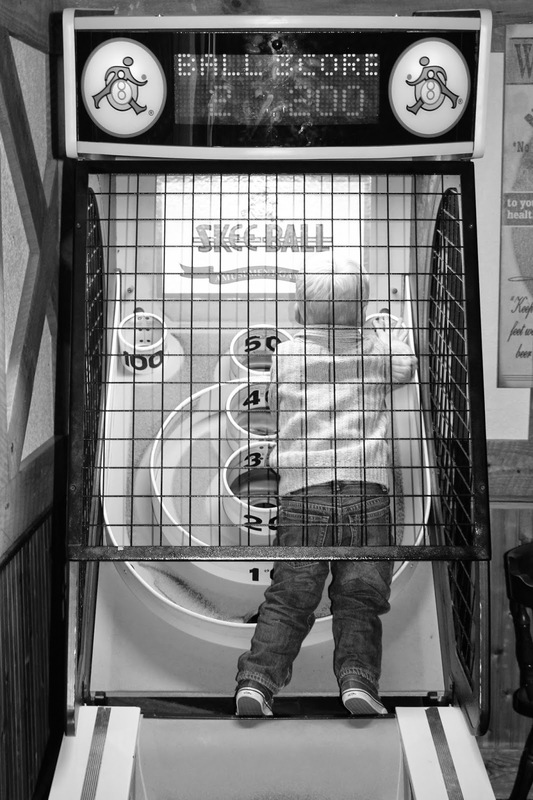 That pic of Liam IN the skeeball thing is too cute! Hope you have a great day lady!